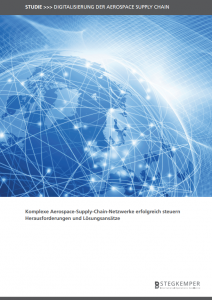 70 percent of respondents in a new study on the digitalization of the aerospace supply chain say they are convinced that digitalization can be advanced only if all parties use the same system. But the reality proves to be different. More than 80 percent of the respondents confirm having to use multiple portals to communicate with customers – and this, even though approximately 90 percent of the respondents were convinced that the multitude of different portals undermined the positive effects of digitalization. Digital Transformation in the Aerospace Industry: The French business magazine L´Usine Nouvelle has published a comprehensive article about the Digitalization of the Aerospace Supply Chain: The Airbus Group, Dassault Aviation, Thales and Safran extend the usage of AirSupply – the industry platform that has been initiated by these companies in 2011 – to the whole Aerospace supply chain. A little over one year ago, Elbe Flugzeugwerke GmbH (EFW) selected SupplyOn’s AirSupply solution to improve the aircraft company’s ordering processes with its most important suppliers. The weather was rainy, but information was hot: this year’s PNAA (Pacific Northwest Aerospace Association) Aerospace Conference in Lynnwod, WA, was again the “place to be” for aerospace decision takers who want to know towards which destination the industry is moving to: Located closely to the Boeing plants of Renton (production of all 737 family aircraft) and Everett (wide-body production, including 787), the PNAA had the biggest participation ever, with 500+ participants.